THIS LEATHER WRAPPED ALBUM IS DESIGNED AFTER AND ARTISTS JOURNAL. IT IS WRAPPED IN GENUINE LEATHER WITH A LEATHER CLOSURE STRAP. 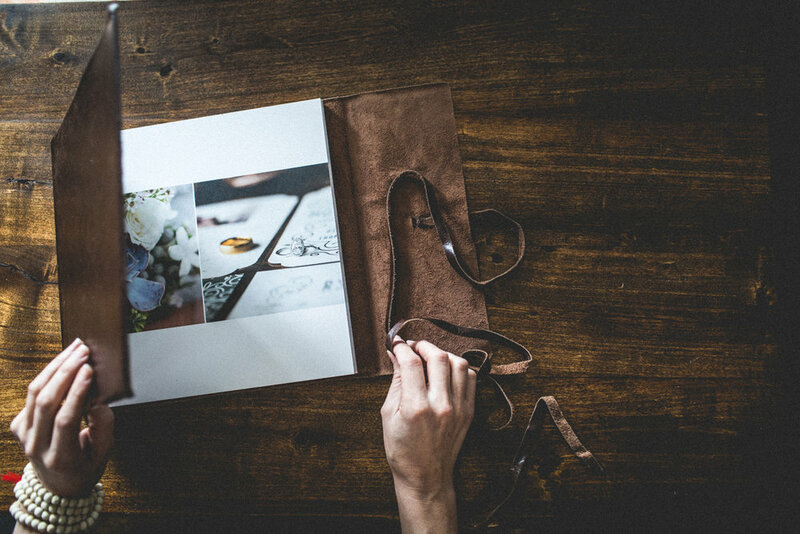 PREMIUM VELVET PAPER IS MOUNTED TO A THINNER VERSION OF THE FINE ART ALBUM MOUNT BOARD. ALL PAGES ARE BINDED TOGETHER WITH SPLIT BINDING WHICH GIVES A SLIGHT GUTTER BETWEEN THE PAGES. IT IS ONE THE THINNEST GAPS MAKING THE BOOK BINDING EVEN STRONGER. EACH TIME YOU UNWRAP THIS ALBUM YOU WILL RELIVE THEIR MOST SPECTACULAR MEMORIES FROM YOUR WEDDING OR LIFESTYLE SESSION.